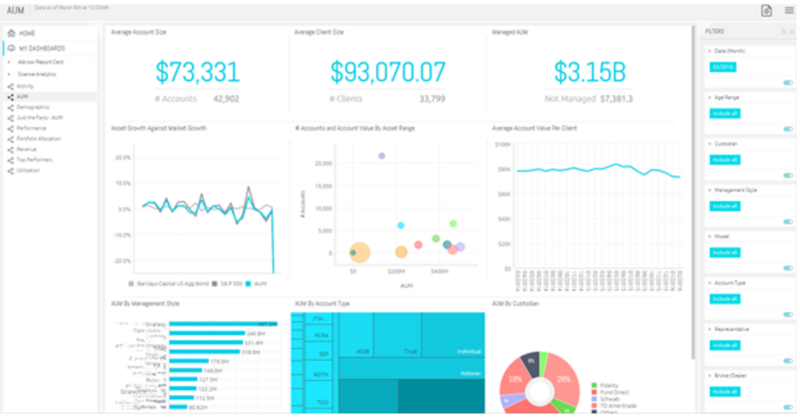 Orion is a premier portfolio accounting SaaS provider for advisors. Its 950+ clients manage assets spanning 1.5million accounts and totaling nearly $375 billion. A lot of responsibility, wouldn’t you say? No wonder they needed a powerful, dependable, accurate BI tool. The trouble was, when we met them, they were using a static reporting solution that served up stale news weeks after month’s-end… while their customers wanted pre-configured, dynamic dashboards. By switching to Sisense, BI expert Malinda Jepsen was able to offer all of this, while even doubling sales revenue at the same time. Orion’s platform gathers and analyzes data on client investments, allowing firms to view overall performance, and identify strengths and weaknesses in their business strategy. Its manually built reporting platform was flexible and customizable, but slow: by the time they generated each client report, it was already out of date. Plus, the data was static, so clients couldn’t delve in to check the details or context. They only had headline figures, giving them an idea of overall performance. If they wanted to analyze this in any way, they’d have to request a special data query. The company needed to move from business metrics to business intelligence. Their customers needed a platform with better visualizations and direct access to accurate, up-to-date data, in order to make informed business decisions. However, with 51 terabytes of data to wade through, finding a BI tool that could handle this volume without sacrificing granularity was not going to be easy. Orion had executed a proof of concept by integrating an Excel interface into their API, but customers found the dashboard-building too complex – they didn’t yet know or understand what they wanted to get out of their data. Clearly, they needed a solution that was ready to deploy out-of-the-box and accessible by all users, not just those with IT expertise. After attempting to build their own solution and then testing five different BI solutions, Orion chose Sisense. Both Malinda and CEO Eric Clarke loved the look and feel of the product, and the sheer ease and responsiveness of it. What’s more, they were amazed to find that they were able to go from the concept stage to getting their final product ready to use within just two months. Their customers wanted pre-configured dashboards, with the interactivity to let them explore their data and drill down into details. Luckily, the white labeling function in Sisense worked perfectly for this: they could embed the BI tool into their product and offer it to their clients as part of their own platform. Now, Malinda says that advisors are better able to monitor business trends, zoom into the details, address questions regarding Assets Under Management (AUM) changes over time, new accounts opened by month/year/quarter, transaction types, top performers, cash flows, demographic trends, and more. Sisense’s Elasticube feature actually helped them to clean up, strip back, and simplify the amount of data they were using, more than halving the 500GB of data that was clogging up their SQL Server. The project has been a resounding success. 98% of Orion’s clients have already adopted the new tool and say they find it easy to use. Nearly 2,000 users from all over the 200gb Sisense Elasticube now engage with dashboard views. Moreover, Orion has seen its business nearly double since the rollout. Orion’s customers went from being unable to explain how the summarized numbers on their monthly report were reached, to being able to trace data all the way back to the source to figure out exactly what happened. End users can go on to explore and explain any surprises, uncovering invaluable insights. Our customer support team loves it, because they can go in and figure out exactly what the data is, and how they got the answers they got. They can drill right down to the detail, so it’s perfect for them.